Something made me chuckle this morning so I thought I would share it on here. Guest blog posting is a great way of building back links to strengthen the SEO of your website, the benefits of that are not up for dispute. Like most things though, there are always some people who just don’t get it. It’s kind of ironic that the article from this morning was one of the many “anti SEO”, “people try to trick people with SEO”, “rank one in Google blah blah…” type of articles. I read a few lines of this particular article and after seeing how long it was, I got the urge to copy and paste the first paragraph to see how many other sites it would appear on. If you are going to have guest blog posts on your website then it would certainly be worth checking to see how unique the article is – even if it is from a “good friend”. Duplicate content should always be avoided, it does your site no favours and when done like this is could start to have a negative effect, ie incur a penalty from Google. It’s good that Google is slowly starting to de-index more blogs and article websites… they rarely add any value and are generally pointless. 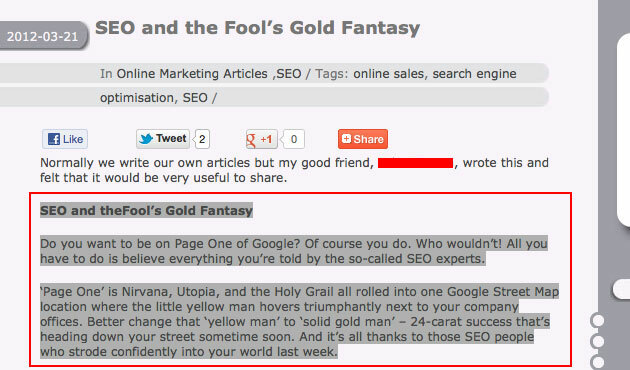 This entry was posted on Wednesday, March 21st, 2012 at 8:53 pm	and is filed under search engine optimisation. You can follow any responses to this entry through the RSS 2.0 feed. You can leave a response, or trackback from your own site.